I'm 15 years old and am hoping to become a chef. Once I'm out of high school I would like to go to Johnson and Whales University and eventually open up my own restaurant. I love the Asian cuisine, as well as the flavors. I've been preparing this recipe for some time now and my family seems to love it and I hope you do as well. Enjoy. In a frying pan, heat oil on medium high heat. Once oil is hot, place the celery, carrots, onions, and garlic in the pan. Once the vegetables become translucent, remove them from the pan. 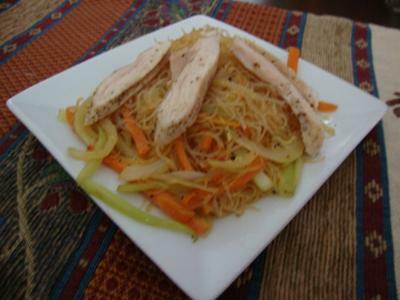 Add one more tablespoon of oil to the pan and add the cooked rice noodles. Once the noodles become hot (about 45 seconds) add the vegetables back in pan. Add the soy sauce, ginger ale, and salt and pepper to taste. Garnish with the ginger and enjoy. *(Optional) Season the chicken breast with salt and pepper, sear the breast in the pan and bake for 8 minutes. 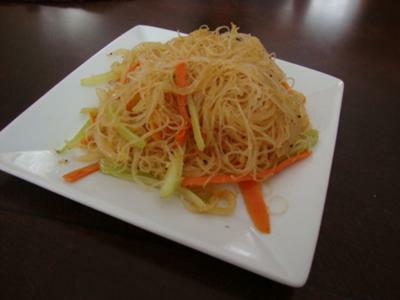 Slice into strips and place on top the Rice Noodles with Julienne Vegetables and Sweet Ginger Ale Reduction. Come cook this when you come visit me in oregon! 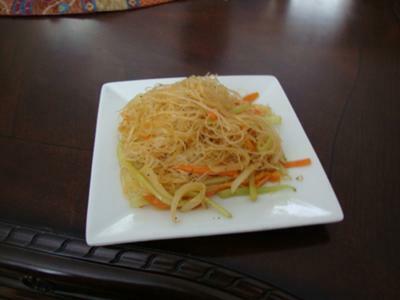 It's not as sweet as i expected, but the grated ginger added great flavor to the dish.